This content is previewed in the video below. 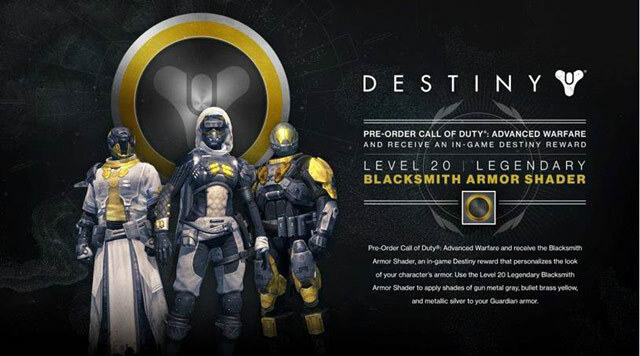 For Destiny players also playing Call of Duty: Advanced Warfare, pre-ordering Advanced Warfare from Gamestop will give you the Level 20 Blacksmith Armor Shader which will allow you to apply three exclusive colors to different armor pieces. Earlier this year Microsoft removed the Kinect 2.0 from the Xbox One to make a second, cheaper option for us to buy. At the same time they announced that it would be sold this Holiday season on its own with no additional information. Now, we have the details. Starting on October 7th, you will be able to buy the Kinect 2.0 for $150 with a copy of Dance Central Spotlight bundled in the box. The Games With Gold for September were also revealed by Major Nelson. For Xbox 360 Gold members, Monaco: What’s Yours is Mine will be free the first half of the month. For the second half, a game we’re all probably familiar with, Halo: Reach, will be on sale. For Xbox One Gold members, Crimson Dragon will still be free and it will be accompanied by Super Time Force. A unique theme is available for the 360, made in partnership by Microsoft and the Call of Duty Endowment team. All proceeds will go to the Call of Duty Endowment program who assist other charities in giving Veterans opportunities in new careers. It is available to purchase in $1, $5, $10, and $20 options. The direct link to download can be found here and the theme itself is shown below. In a new skin pack for Minecraft: Xbox 360 Edition, the TARDIS brings Doctor Who to to your blocky worlds. The new skin pack features several Doctors from the show, their companions, and a few of the Doctor’s enemies. The skin pack will be priced at $2.99 and will be coming out in September. A Forza Horizon 2 demo will be available for all Xbox One users to download starting September 16th. The demo is releasing 2 weeks before the release of the game on September 30th. The achievement list for the game at launch has also been revealed. You can see the full list of Achievements here. The next-gen Assassin’s Creed game will be pushed back a bit. Unity will be receiving a November 11th release date this year to polish the game further. The new release date also coincides with Assassin’s Creed Rogue’s release date on the same day. So Day One players on both consoles can kill Assassins as Templars and kill Templars as Assassins at the same time. 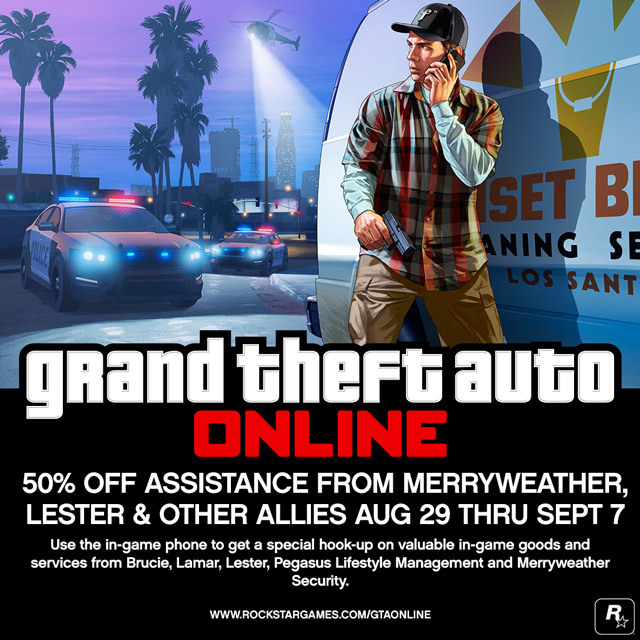 As the picture above says, all allies in GTA Online will give you a 50& discount in GA Online until September 7th. These contacts are: Lester, Lamar, Brucie, Pegasus, and Merryweather. All rank requirements for these services have been removed for the duration of the event, so even if you just started playing, you can still can in an airstrike for half the price. NOTE: If you own an EA Access membership the 10% off of DLC and Games will apply to these sales as well. Tagged Assassin's Creed Unity, Call of Duty Advanced Warfare, Crimson Dragon, Destiny, GTA Online, Halo Reach, Microsoft, Minecraft, Monaco What's Yours Is Mine.